A man in boots and tall hat, scarf, jacket and rolled-up trousers, stands on the steps of a grand front porch with stone columns while two faces peer out of a window in this city scene. 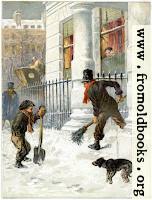 A boy on the street holds a snow-shovel in one gloveless hand and has his other had in his pocket. He wears a cap and scarf. A doog looks on in the snow-covered street and in the background a man wearing a top hat walks past a genteel iron fence and a horse-drawn coach drives past in the distance. 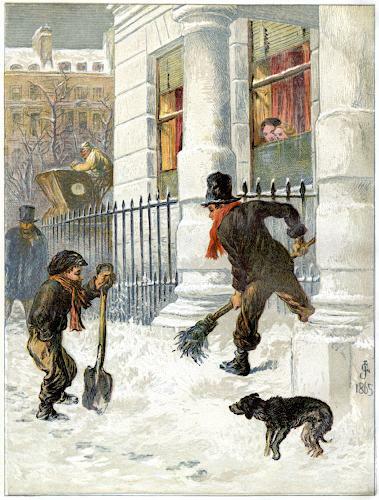 The picture (which is in colour, probably a chromolithograph) is signed with a JG monogram and the date 1665; the caption is “The snow sweepers”.